An energy projector, also known as a cleansing beam, plasma lance, or ventral beam due to its most common placement on warships, is a Covenant weapon used exclusively by large capital ships. It fires a thin beam of the energized matter known as plasma, capable of destroying ships effortlessly at long range and "glassing" planets, systematically rendering them sterile and incapable of sustaining life. A CCS-class battlecruiser using its energy projector to help contain the Flood outbreak in Voi. The weapon fires a thin beam of highly energetic particles, or plasma. It typically requires a brief charging period, during which a visible maelstrom of plasma appears around the emitter. The beam has an effective range of over 100,000 kilometers. The beam varies in color, possibly according to power output, but it generally appears as a silver-white color, similar to the scintillation effect that is seen when a Covenant ship's energy shields are hit. Beams in the red, purple, orange and blue spectra have also been observed. The energy projector's long range allows a ship armed with such weapons to 'snipe' targets during ship-to-ship combat. The weapon has been observed to gut UNSC ships from stem to stern, as happened to the frigate UNSC Gettysburg over Reach. The "glass" seen on the surface of Reach after being melted by an energy projector. Against UNSC vessels, the weapon is able to pierce dozens of centimeters of Titanium-A armor with comparative ease, rendering any form of physical defense useless. A single hit can potentially disable or destroy vital systems, such as the Magnetic Accelerator Cannon or engines, as seen during the Battle of Earth when a single pulse from an assault carrier's dorsal energy projector crippled a Marathon-class heavy cruiser. If an energy projector strikes in a critical area, such as the reactors of a ship, it could destroy the ship instantly. The beam is functionally similar to the infantry-issued Type-50 particle beam rifle, albeit on a vastly larger scale. It is also speculated that the beam can be focused to varying degrees. In space, the beam can be focused to a smaller, more concentrated, and thus more powerful beam generally used to decimate enemy fleets from afar. It also seems to drain all or most of the energy in a Covenant ship for a brief period, unless the ship is big enough to supply the power without too much of a drain. When used for "glassing" a planet, the energy projector causes near-total atmospheric and biospheric destruction. The beam vitrifies the soil, converting massive swaths of terrain into molten glass, and causes massive atmospheric disruption. The climate of the planet is drastically altered, sometimes permanently; Harvest's global temperature dropped after being glassed, sending the planet into an "ice age." An energy projector beam also generates massive electromagnetic disturbances; energy shield systems are known to fail when within several miles of an active beam. According to Frederic-104, "Only the big ships have them". ORS-class heavy cruisers, assault carriers, CSO-class supercarriers, CPV-class heavy destroyers, CCS-class battlecruisers, and an unidentified class are known to be equipped with energy projectors. Assault carriers are armed with one energy projector underneath the bow, one on their dorsal sides, and one near the gravity lift. CCS-class battlecruisers feature one under the bow and one on the underside of the gravity lift platform. Covenant CRS-class light cruisers carry their own ventral beam weapons - most likely smaller, less powerful versions of the energy projectors used by their larger cousins. This weapon charges up like an energy projector, but glows green. In 2557, a Covenant light cruiser orbiting Requiem attempted to destroy the UNSC Forward Unto Dawn using its ventral energy weapon, but was stopped when John-117 destroyed the cruiser with a Hyperion-class nuclear missile. Some classes of Covenant space stations also carry energy projects as their main defensive capability; one of the few known instances of this was when the UNSC Infinity encountered a Covenant battlestation orbiting the gas giant Oth Lodon in 2558. In this engagement the station, commandeered by Insurrectionists of the New Colonial Alliance fired the station's main energy projector upon the UNSC flagship, severely damaging it with a single shot. This particular projector was mounted upon the station's central "tower", allowing for maximum range and effect against approaching targets. Pherex-pattern - Used on the Hekar Taa-pattern Blockade Runner. Profero-pattern - Used on the Ket-pattern CCS-class battlecruisers. Infernus-pattern - Used on the Sinaris-pattern CPV-class heavy destroyer and the Kerel-pattern CAS-class assault carrier. Phar-pattern - Used on the Varric-pattern ORS-class heavy cruiser. Energy projectors were used in the large-scale glassing of planets, such as Reach. The energy projector was first encountered by the UNSC during the Second Battle of Harvest, where it was used by a Covenant super-destroyer. It was more frequently seen in later years, such as during the Harvest campaign and Operation: TORPEDO. Throughout the course of the Covenant invasion of Reach, the population centers suffered tremendous structural damage due to the Covenant's glassing of the planet. Similarly, several frigates fell prey to the energy projectors during the engagement. In a bid to kill John-117, the Solemn Penance used an energy projector to destroy the Prophet of Regret's temple after his assassination by the Spartan on Installation 05. In the Battle of Earth, the city of Voi was glassed by the Fleet of Retribution to stop a Flood infestation. According to Lord Hood, half of the African continent was glassed shortly after, though it was almost certainly an exaggeration given the lack of damage when Voi is later seen and his distaste for the Sangheili. In order to destroy Enduring Conviction, Professor Anders and Douglas-042 immobilized the carrier and depleted its shields, allowing Isabel and Jerome-092 to enter the ship with Alice-130's assistance. Hijacking the weapon systems, Isabel fired on Installation 00 to trigger the defense network. In Halo Wars, the Prophet of Regret uses the Cleansing Beam as his leader power. An orbiting vessel "glasses" the target, and has the power to destroy almost anything. The weapon's capabilities can be upgraded to progressively increase power and decrease supply usage at the temple. The upgrades are named Regret's Sentence, Regret's Doom, and Regret's Condemnation, respectively. To use it, the player must select the Prophet of Regret and press the Y button. The player can then use the left thumbstick to move the beam around the Prophet's field of view. The Cleansing Beam can damage all units, including the player's and allies' forces; however, Regret himself cannot be damaged by the beam. The beam's color is dependent upon the player's team color. The color of the energy projector's beam is not the same in every game. In Halo 2, it is purple. In Halo 3, Halo 3: ODST and Halo 2: Anniversary, it is blue. In Halo: Reach, it is red, In Halo Wars it changes depending on what the team color is. This may be indicative of different power settings, as the energy projectors of CCS-class battlecruisers have been seen in all three colors. The time an energy projector takes to charge also varies. The CCS-class battlecruiser fought at the end of Halo: Reach takes 20 seconds to charge its energy projector, while ships of the same class in New Alexandria are shown charging theirs in only two, then sustaining fire for seven seconds. Likewise, a CAS-class assault carrier in ODST is shown charging its projector in thirty-six seconds, but an earlier one charges its own indefinitely until the player passes through a gate. This could be explained by a difference in operation, such as the cruisers at New Alexandria needing to expend less energy to destroy some buildings at New Alexandria while needing more to cut through the heavily armored UNSC Pillar of Autumn. 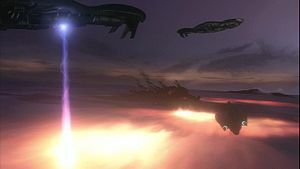 A Covenant assault carrier firing its energy projector in Halo 2. A close-up to the energy projector used by a CCS-class battlecruiser. Large Covenant ships, such as the Shadow of Intent, have energy projectors located on their undersides. A Covenant assault carrier glassing New Mombasa with an energy projector. The CSO-class supercarrier Long Night of Solace using its energy projector on the UNSC Grafton during the Battle of Viery. The Covenant battlestation at Oth Lodon fires its main energy projector at the UNSC Infinity. John-117 avoiding Solemn Penance's energy projector. The Unrelenting firing its energy projector. ↑ Halo: The Essential Visual Guide, page ?? ?